3 BR -1 Bath The perfect family retreat! Located on the eastern shore of Spider Lake, part of the Manitowish Chain. Play lawn games all day, enjoy cocktails on the porch during a stunning northwoods sunset, run and jump in the lake at Sun Valley - the perfect family vacation rental retreat. 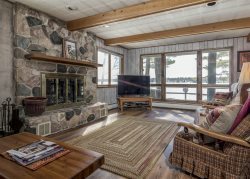 Located on the eastern shore of Spider Lake, part of the Manitowish Chain of 10 Lakes, Sun Valley boasts an impressive front lawn, a private dock, and sandy frontage for swimming. After a full day outside, enjoy dinner around the family table and end the night with board game and s'mores around the fire gazing at the Northern Wisconsin starlit sky. Stay close to home for the weekend, or venture out on the water to explore the Chain of 10 Lakes - make sure to stop at Greer's Pier Marina for one of their signature cocktails. Sun Valley is located just a short drive from Manitowish Waters' most popular restaurants: Aberdeen Restaurant + Bar, and Blue Bayou Inn. Sun Valley is 3 bedrooms, 1 bathroom, with the sleeping capacity of 6. Trundle bed in the great room. Great! Very nice to work with and responsive! Nice place! Well appointed and cute! Super cottage with amazing waterfront! Not too fancy and not too rustic! Great location too! We enjoyed ourselves immensely. The grounds had ample room for catch, bocce (appreciate that they were available). The swimming area and beach were fantastic. Our family really enjoyed using the paddle board and kayaks. We also enjoyed sitting around the fire in the Adirondack chairs. This was one of our most relaxing vacations in Manitowish Waters! We are a family of readers but we found the living area very dark unless seated by the windows for some light. We actually purchased 2 floor lamps at Walmart (dorm type) which made a huge difference. This is a common problem with rentals. Lamps provided are usually too dim and too low. We never turned on the t.v., but did appreciate wifi. Another recommendation we would suggest is providing info on the website about the provision of fans. We had no info so brought several which took up unnecessary space in the cars. We pretty much expected bedrooms with no closets since the photos don't show any so we were happy to find one in each room. Sun Valley's location on Spider Lake was really convenient as well. The cottage was very clean and comfortable. Grandkids loved the sand beach, large grass area to run, swimming, jumping off the pier, internet access, fishing, camp fires and the beautiful sunset. Privacy was truly appreciated being tucked in a little cove!